Customize and upgrade your HOn3 fleet with Blackstone Models accessories. These accessories are assembled and ready to install. 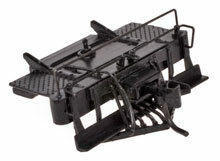 All Blackstone Models free-rolling trucks feature blackened metal wheels and crisp details with durable plastic frame. These composite trucks were standard for most Rio Grande coaches from 1881 onward, and work well with many early-era passenger cars. They are available in Pullman Green and black. Electrical pickups are included. The most common freight car truck style used in early railroading, this American Car & Foundry design is still in service today on historic narrow gauge railroads. Choose from three colors -- Black, Boxcar Red, and MOW Gray. 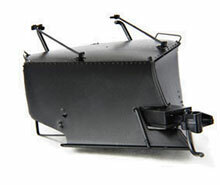 The leaf springs added to these traditional arch bar trucks provide extra comfort for trainmen. Electrical pickups are included. This 30-ton capacity truck became common in the early 20th century. Although they were typically used on Rio Grande narrow frame tank cars, they adapt well to various types of rolling stock. Originally designed in 1939 to replace Andrews trucks on UTLX frameless tank cars, this 30-ton capacity truck is just the ticket for many later-era freight cars. 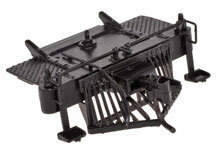 Widely used on the East Broad Top (EBT) Railroad, the Vulcan frame truck is a unique addition to any piece of rolling stock. Designed specifically for refrigerator cars, these 20-ton capacity trucks are perfect for adding a prototypical look to short reefers. 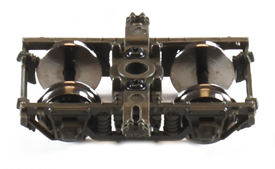 The following accessories are designed to fit Blackstone Models K-27 locomotives. When your locomotive isn't assigned to switching duties, equip it with this road pilot for a traditional look as it traverses your mainline. Put your Mudhen to work switching cars around the yard by outfitting it with this switcher pilot. Battle the elements and keep your track clear with this classic snowplow.